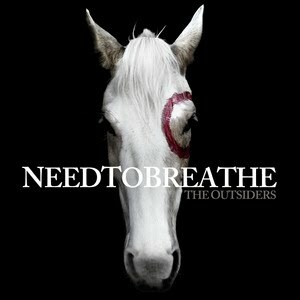 NeedToBreathe’s, “The Outsiders,” does not carry a particularly new sound, but boy does it carry a powerful one. Several songs such as “Garden” and “Lay ‘Em Down” carry seemingly religious undertones and all the songs have a sort of moral message like “Let Us Love’s” “let us love like we were children.” The album as a whole does not have a theme to be found in the lyrics, but each song is a thematic masterpiece unto itself. Take for instance “Prisoner” with its continual references to a loss of freedom or Hurricane’s torrent of words and sound. What links the album as a whole is more its musical style. NeedToBreathe is really conscious of pace evoking a feeling, which works well for making their songs more meaningful. Frequently featured guitar picking gives a homey country (think Vermont, not Texas) feel. There’s a current of rock flowing through all the songs, and not just rock–roll, “Girl Named Tennessee” could teach many so-called rockers at the top of the charts a thing or two about rock n’ roll. Buliding off this country rock n’ roll feel, a few well placed anomalies such as the strings at the beginning of “Garden,” the harmonica in “Stones Under Rushing Water,” and the stomp/clap in “Lay ‘Em Down” add real character to this record. The end of “The Outsiders” and the ethereral beginning of “Something Beautiful” are thoughtful details which bring depth to the album. The vocals are consistently strong. The range of the voices is beautiful and perfectly appropriate to the country feel. The multi-vocal touch of “Prisoner” and “Through Smoke” is an unexpected treat. The pairings of male and female voices for “Stones Under Rushing Water,” creates a very “9 Crimes” (by Damien Rice, look it up!) feel. “What You’ve Done To Me” has some almost-angry vocals that add serious dimension to the music. If you like this you’ll also enjoy: Gavin Degraw, Coldplay, Bryan Adams.